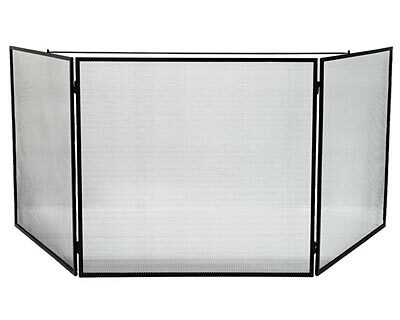 Keep your children or pets fully shielded from your fireplace using this Achla Black Three Panel Large Fireplace Screen. This generous screen sports two 28" wide side panels and a 32" wide center section, forming a truly dramatic look on your hearth. The black color of the piece adds a traditional feel, and its wrought iron construction remains sturdy for many seasons. The hinged panels may be placed at a bevy of angles, and the included stability rod may be installed at the top to keep the unit open. The 0.125" square mesh within this frame stops sparks and embers from reaching your floor, and the screen's 30" height adds drama. Its black hue and wrought iron body last for seasons of use, and the panels may be folded inward for easy storage. Ensure your family remains protected from embers with this Black Three Panel Large Fireplace Screen.